The Track You’re On | What is the Meaning & Purpose of Life? But even though you may have felt you had “the best laid plans” and have long been pleased with direction and speed by which you have reached the various stations in life, things may suddenly take an unexpected turn, perhaps after a rail switching error a few stations back (i.e., a bad decision on your part) and you suddenly find yourself barreling down the tracks toward what you know to be the last stop of “No-wheres-ville”. 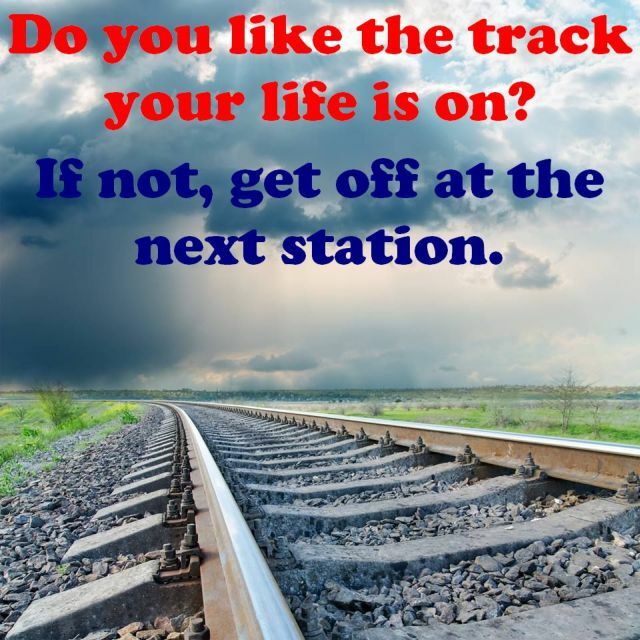 It is at this point you must plan to get off at the next station, and change your direction. And for God’s sake if you find yourself on “an express” with the wrong people — pull the damn chord for the emergency brakes, or if need be, jump off and hope for the best as you tumble down an adjacent countryside embankment ! What then should you do? If are able to calmly get off at the next station, great; however, if you had to jump and managed to survive the fall, then brush yourself off and head off in an entirely different direction with an upbeat attitude, of course. And what should you do next? Follow the advice of the late rock star and guitar impresario Jimi Hendrix, as articulated in his diddy “Hear My Train A Comin“, featuring his magical digit manipulations on a 12 string acoustic. In this case, the lyrics (reproduced below) tell of the need to part ways with those dragging you down, leave the town that put you down, make a whole lotta money, and then . . .
BUY THE DAMN TOWN ! ! And for you Hendrix lovers who yearn for the electric version, here you go . . . This entry was posted in Embrace Change, Overcoming Obstacles, Recognizing Problems and tagged Hear My Train A Comin', Jimi Hendrix, Train Tracks. Bookmark the permalink.